It can come about for a variety of reasons, so let’s take a look at some of the most common ones and how we address them with Rolfing. First, it’s important to note that the head and neck are usually posturally positioned as a result of what’s happening in the rest of your body. Anything from tension in the calves to misalignment of the hips to an overly curvy spine can affect how you hold the weight of your head. As such, it’s not uncommon for people to come in with neck pain and for us to start working on the feet or lower legs. That’s also why we typically work on the neck at the end of every session we do in Rolfing - changes in the body tend to flow upwards. In order to balance out the neck, it may be important to balance out the rest of the body as well, or the pain may just end up coming back. Lifestyle factors are also a huge influence in neck pain. Check out the image above. I’ve included this image in several other articles because it’s hugely relevant for our modern day predicament. Any time you hold your head forward, it significantly increases the amount of weight the muscles and ligaments of the neck have to support. Amplifying this issue is the fact that we may hold the head forward all throughout the day. 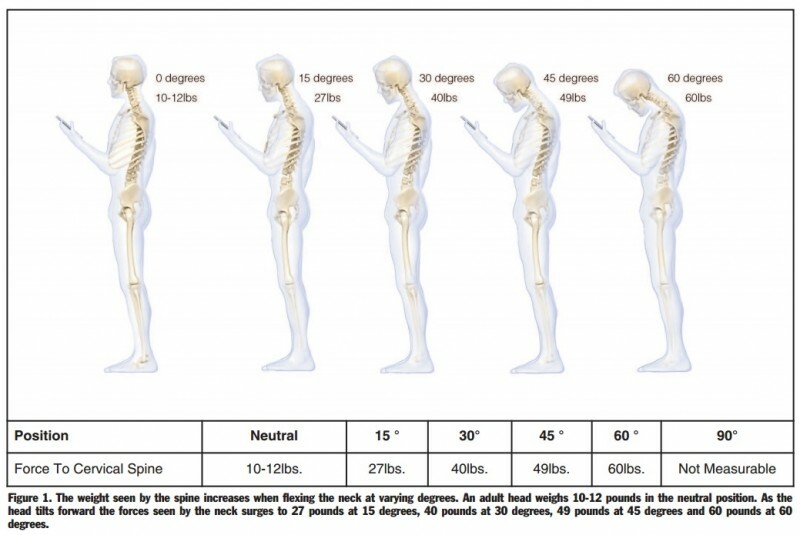 Most people aren’t on their cell phones for 8 hours a day, but if we add in your posture while you’re driving, or when you watch television, or using your computer at work, your head ends up being forward for a significant portion of the day. The more forward your head is, the more weight it puts on the muscles and ligaments that have to support it. It’s no wonder those muscles get sore! Whiplash is another of the key contributors to neck pain. As I’m sure you’re aware, especially if you’ve experienced it, when the neck is whipped forward and back (or side to side, or any combination of the two), the muscles go into a state of panic. When muscles panic, they “lock down”. This is why most people have extreme neck pain and headaches after a whiplash incident. You may not have actually damaged anything in the neck; the muscles are just in a state of emergency, and will be until they can either relax naturally or be released. If the muscles of the neck have trouble relaxing naturally, this pattern will set into your body and become your new normal. As you can imagine, this is not a good thing because it means that the level of pain becomes your new normal. And finally, one of the most common factors - stress. Many people report “holding their stress in their shoulders.” Similar to whiplash above, if the stress is held in the shoulders for long enough, it becomes your new normal. Therefore, even if you aren’t currently under stress, your body acts as if it still feels every deadline and stressful incident that’s ever happened to you. Again, as you can imagine, that’s not a good thing. Releasing this long-held tension and returning your body to a state of neutrality becomes of the utmost importance. What do we work on in a Rolfing session? Also know as the traps, This is a key muscle for the back of the neck and shoulders, and is typically the location people refer to when they say they hold their stress in the shoulders. As you can see, it’s diamond-shaped muscle that spans from the neck down to the middle of the back, and out to either shoulder. This, along with the nuchal ligament, is one of the main supporters of the head from the back of the body, and also helps to lift the shoulders up. We work to release the connective tissue in this muscle and, perhaps equally important, release its attachment to other muscles in the area to allow it to glide freely and to be able to drop back down to its natural, neutral position. 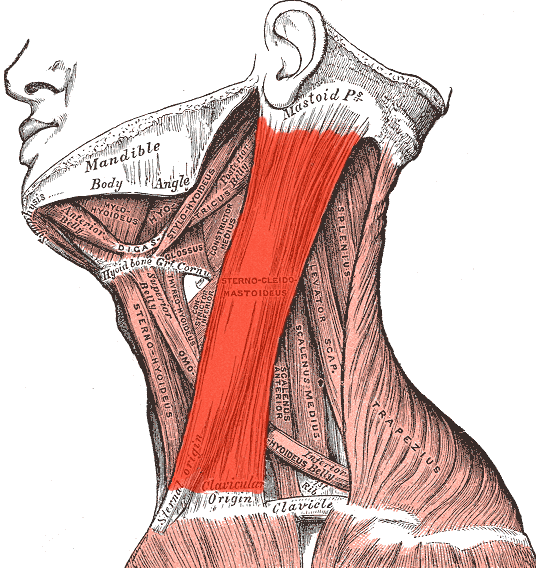 The Scalenes are sometimes referred to as the “guy wires” of the neck. They’re one of the main supporting structures on the front of the neck, and therefore also one of the main muscles people have problems with. In addition to stabilizing, they help to move the neck from side to side and rotate from right to left. There are three of them on either side of the neck. Similar to the Psoas, they are muscles that don’t respond well to direct touch. Therefore, we work on them by freeing their fascial adhesions from other muscles in the area and then do specific exercises to allow them to relax naturally. The sternocleidomastoid is a large name for a relatively large muscle on the front of the neck. It runs from the sternum/clavicle attachment (at the top of the breastbone) to the skull at the mastoid process (just behind the ears). Thus the name, sterno-cleido-mastoid. I usually just say SCM. The main problem with this muscle is that it tends to pull the head forward. Therefore, it’s one of the main muscles we work in the neck in order to allow the head to release back towards a neutral position. As you can see in the images, there are also several other layers of muscles and connective tissue in the neck. These three above are the main areas we focus on, but worry not: we end up working on everything. After Rolfing, there are a variety of stretches and exercises you can do in order to keep your head in proper alignment and release tension that may build up from stress or physical activity. I’ll show you a variety of these, depending on your situation, that you can use either as a preventative or as a way to help once the pain starts.